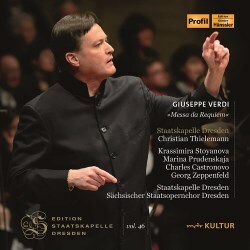 This account of Verdi’s great Messa da Requiem is a recording of the live radio transmission by MDR KULTUR in the Semperoper given ‘in memory of the destruction of Dresden on 13th February 1945’ performed on the anniversary date in 2014. The horrific bombing of Dresden began on Tuesday 13th February 1945 and two days later the historic city was destroyed, reduced to a smouldering ruin and a great number of inhabitants at least 25,000 perished. Consequently, the 13th February has become known as Dresden Memorial Day and in the city on that day in 1951 Rudolf Kempe conducted Staatskapelle in Verdi Requiem. As Semperoper lay in ruins from bombing Kempe and his choral and orchestral forces had to use the large auditorium of Staatstheater, now known as Schauspielhaus. It has become a tradition each Dresden Memorial Day for Staatskapelle and Staatsopernchor to perform one of the great requiem settings or another comparable work deemed appropriate to the occasion. I notice that a few weeks after Verdi Requiem received its German première in Cologne the first Dresden performance was given under Ernst Schuch at Semperoper on 8th January 1876. Traditionally there is no audience applause at Dresden Memorial Day concert and it ends with a reverential minute’s silence. The various ceremonies carried out in the city on Memorial Day have been described as symbols of mourning, reconciliation and peace. Verdi’s Messa da Requiem is probably the best-known requiem mass in repertoire today. Many great conductors have recorded the score. I’m thinking of Toscanini at New York in 1951; Victor De Sabata at Milan in 1954 and, surely best known of all, Carlo Maria Giulini at London in 1964/65. Few works have the power to move an audience to tears as Verdi's Requiem. At the Dresdner Musikfestspiele 2013 I was bowled over when reporting from an inspiring performance of the Verdi Requiem at Kreuzkirche, Dresden with Gianandrea Noseda conducting Orchestra e Coro del Teatro Regio di Torino. Noseda’s first-class quartet of soloists was Kristin Lewis, Sonia Ganassi, Francesco Meli and Ildar Abdrazakov (review). Impeccably prepared, the Staatskapelle Dresden, the quartet of soloists and the Staatsopernchor Dresden perform magnificently for Thielemann in a secure and powerfully characterised account. Unerringly vital and well-paced Thielemann gloriously brings out awe and drama from this magnificent sacred score. In the core of the work, the magnificent Dies irae, I love the way Thielemann and his forces communicate an emphatic and thrilling depiction of judgement day with the orchestra displaying its dramatic strength and stirring sacred passion with full-bloodedly vivid climaxes. A feature that often disappoints, I am pleased to report the bass drum strikes are suitably powered. As one expects from a live recording nothing is ever perfect however the orchestral playing is resoundingly successful. Thielemann has the advantage of four well differentiated and highly effective soloists who are in excellent voice gelling together strikingly as a team as demonstrated by the quite special rendition of the Lacrymosa. Krassimira Stoyanova, the Bulgarian born soprano, impresses for her rich warm tone, clear diction, gleaming top register and sense of reverential expression. Especially striking is her anguished declamation in the Libera me where Stoyanova fluently negotiates her demanding part which is satiated with contrasting emotion. Her performance is compelling with such beautifully shaded singing making the hairs stand up on the back of my neck. Of the many notable passages, I found especially moving the beautiful duet between Stoyanova and Prudenskaya in the Recordare poignantly reflecting on the passion of Christ with their voices blending together divinely. Assured lyric tenor Charles Castronovo demonstrates his supple voice with clear tone. The famous tenor solo in the Ingemisco section is affectingly sung by the American with significant devout expression and a pleasing if rarely achieved sense of vulnerability. Interspersed are the splendidly rendered solos from the oboe principal. Russian mezzo-soprano Marina Prudenskaya, with her rich, warm timbre and considerable artistry, conveys movingly sacred expression to her solo in the Liber scriptus which is punctuated by ominous snatches of the Dies irae. In the Lacrymosa dies illa Prudenskaya is in inspiring voice, moving smoothly and securely through her range. Another highlight is the Quid sum miser which creates a welcome and soothing mood. The section opens with the confident Prudenskaya accompanied by the splendidly played lilting bassoon. Exceptional singing by imperturbable German bass Georg Zeppenfeld, who projects his dark, rich voice easily with such potent intensity. Zeppenfeld conveys compelling menace in the arresting Tuba mirum especially with the words Mors stupebit et natura and in his solo Confutatis maledictis the secure bass engagingly shifts with ease between the required temperaments of condemnation and compassion. Of special note is the Oro supplex section, one of the most moving melodies in the work. Making a significant impact throughout Staatsopernchor Dresden under the coaching of chorus master Alan Woodbridge performs with irrepressible spirit, character and satisfying unity. My highlight is probably the Lux aeterna with the mezzo, tenor and bass coming together with an intensely affecting plea for perpetual light to shine upon the souls of the faithful departed. With excellent clarity and balance between the orchestral and choral forces this MDR KULTUR live radio transmission is quite closely recorded with the sound fitting snugly into the aural picture. As mentioned above, the tradition for no applause at the conclusion is maintained. In the 56-page booklet the essays written by Dr. Torsten Blaich are to the usual high standard of this Edition Staatskapelle Dresden series, full of helpful information including numerous photographs. I am pleased to report full Latin texts are provided with translations in German and English. Not surprisingly there are a number of excellent recordings of the Verdi Requiem in the catalogue. My most prized recording is the ‘classic’ account conducted by Carlo Maria Giulini a magnificent 1963/64 performance with Philharmonia Orchestra and Chorus with soloists Elisabeth Schwarzkopf, Christa Ludwig, Nicolai Gedda and Nicolai Ghiaurov. Powerful, formidably dramatic and full of sacred awe Giulini recorded the work at Kingsway Hall, London for (Columbia) EMI Classics. One of the most affecting accounts I have heard was recorded live in 2013 by the Chor and Symphonieorchester des Bayerischen Rundfunks under Mariss Jansons with soloists Krassimira Stoyanova, Marina Prudenskaya, Saimir Pirgu and Orlin Anastassov at Philharmonie, Munich on BK Klassik. In addition, I greatly admire the scorching 2009 performance from Antonio Pappano with Orchestra and Chorus of National Academy of Santa Cecilia, Rome with soloists Anja Harteros, Sonia Ganassi, Rolando Villazón and René Pape. In Pappano’s account most striking is the sheer dramatic intensity generated at Auditorium Parco della Musica at Sala Santa Cecilia, Rome on EMI Classics. Thielemann’s live Dresden recording of the Verdi Requiem given on Dresden Memorial Day is one to treasure and deserves to be placed in the elevated company of the classic Giulini on EMI.